I know not every couple does a big send off at the end of the wedding, but I’m kind of a fan of them. It’s the last hurrah before the newlyweds lose the title of bride and groom and simply become Mr. and Mrs. It’s also one last goodbye before they ride off into the sunset to enjoy their happily ever after (or maybe that’s just the way it works in the movies?). Either way, it’s the perfect ending to an incredible day and night of celebrating. Though I was originally leaning towards a snowy send off, I’ve since changed my mind and have my heart set on sparklers. My venue has a lot of photos of other couples doing sparkler send offs at their weddings and I think they look like so much fun. Did you have a big send off? What did you do? We had bubbles! 🙂 The pics were fun! Krissy @ Shiawase Life recently posted..Tuesday Treat. We did sparklers! So fun! I’ve also heard that colored sprinkles create amazing pics! Love the sparkler send-off idea! We haven’t gotten that far in planning, but I don’t think we’ll have a send-off at all. We will most likely want to party with our guests until they are pooped out, so we’ll just close out the night. Tip: My sister-in-law is a wedding photographer, and she recently did a wedding where they had a sparkler send-off. The bride wanted to do one of those “LOVE” sparkler photos, which look great, but if your photographer isn’t familiar with it, tell him (her) the key is to keep everyone as still as possible and only move their sparkler into their letter. Just keep doing it without moving any other part of their body, and the photo turns out great. That sounds so beautiful! I love weddings, am a sucker for romance and since I had a giant sparkler on my birthday cake I love those too! I hope this works out for you! It will look amazing if it does. We didn’t have a send-off because we stayed until everyone else had left! Our wedding was small (30 people), so we didn’t have a send off. Basically the DJ stopped playing and we all went to the 24 hour bar at the hotel, haha. We didn’t do a send off (I didn’t want to miss any of the reception and we ended up being the last people out of the reception room), but I love the look of the sparklers for outdoor weddings! My friends did the sparkler send off and it was beautiful and fun! I am so doing sparklers for my send off! (: I can’t wait! We went the traditional route and did bird seed. 🙂 (which ended up ALL in my hair, my mouth, eyes, and down my dress) Ha! But it was hilarious and made for fun pictures with our expressions. I think the sparklers would look amazing and create awesome pictures. We didn’t do a send off but did book a limo to take us to our hotel. As much as I didn’t want to get in a cab in my wedding dress or make someone not drink in order to drive us, I was pretty disappointed when the limo came – I was having so much fun and really didn’t want to leave! I like bubbles! I think they look pretty. The sparklers sound awesome too!! I love following your wedding post! I’m planning a wedding too (17 Days) and enjoy seeing what other people are doing or having at their weddings. Sloane @ Life Food and Beer recently posted..The Tale of a Busy Bride! We shut the party down at our wedding – at the end it was us, the MOH, the Best Man and two groomsmen hanging out on the dance floor! So we didn’t do a big send off. But I do think it sounds fun! We did sparklers and it was SO fun! I’m glad you’re doing it too. It is magical. you mean you’re not gonna walk around and take down decorations as people are hugging and remind people to grab centerpieces 😉 I’m guilty of that, as are so many others! 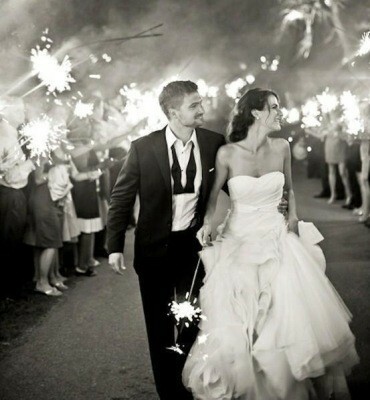 I love the sparkler idea! I so wanted to do this for our wedding send off, but our venue had strict rules about throwing things (rice) or anything with fire. So we opted instead to make a wedding wand that our guests could wave. It was chopstick type stick with ribbons (in our wedding colors) tied on in long strands. The guests waved them as we walked by. It still looked cool in the picture — but I do think the sparklers will be an awesome touch for you guys! This is such a cute idea! I really love how the sparklers light up the scene. We did a sparkler send off, and I think our guests had even more fun with it than we did (since we didn’t even get to hold a sparkler, haha)! Good move on getting the longer sparklers: you definitely need them if you want photos of the sparkler exit! My friend got married a few months after me and bought only the short ones…no one was able to get their sparkler to light simultaneously and it caused a ton of smoke…ooops! At least she wasn’t really caring at that point in the evening, haha! I’m a bridesmaid in a wedding in January and I believe the plan is bubbles. My friends’ reception site does not allow sparklers or a few other send off options. The bride plans to have a couple of groomsmen man those big bubble guns to make sure there are plenty of bubbles! My favorite sendoff, though, has to be thrown rose petals at another friend’s wedding. It was awesome looking. We didn’t do a send off because we knew that we’d want to be at the reception the entire time. We were the last people to leave, which we did so in my in-laws truck (they drove us to our house, where we had approximately 4 hours of sleep before leaving for our honeymoon). I do like the idea of a send-off, though!